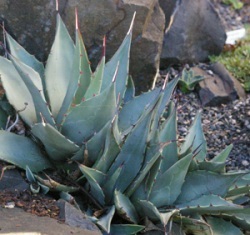 Joy Creek Photo Archive (c) all rights reserved We grow Agave neomexicana in our rockery where its smaller size and colonizing habit seem right at home. The mature rosettes have thick, broad, blue green leaves which are tipped with dark burgundy needle-like points. In ten years this has created many offsets within a yard of the mother plant. In fall, spiders spin fantastic webs between the leaf tips. Needs sharp drainage and full sun. Summer. 8-10 in. x 12 in.